“Judge Gorsuch has a superb intellect, an unparalleled legal education, and a commitment to interpreting the Constitution according to its text. He will make an incredible Justice as soon as the Senate confirms him,” said the US president. 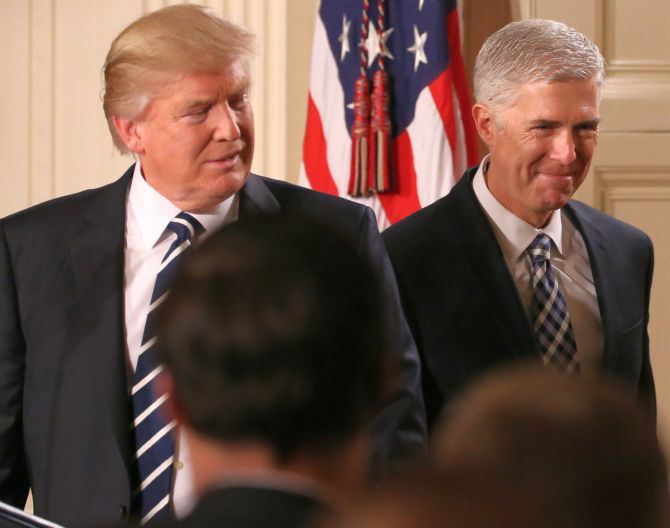 United States President Donald Trump has nominated conservative judge Neil Gorsuch as his Supreme Court nominee, a selection which has sparked strong opposition from the Democrats. Born and raised in Colorado, 49-year-old Gorsuch of the US Court of Appeals for the Tenth Circuit is the youngest Supreme Court nominee in a quarter century. “I am proud to announce the nomination of Judge Neil Gorsuch for Justice of the Supreme Court,” Trump said in a major announcement from the east Room of the White House on Tuesday. Gorsuch attended ColumbiaUniversity and HarvardLawSchool. After graduating with honours, he received his doctorate from OxfordUniversity as a Marshall Scholar. “This has been the most transparent and most important Supreme Court selection process in the history of our country and I wanted the American people to have a voice in this nomination,” Trump said. “Judge Gorsuch has a superb intellect, an unparalleled legal education, and a commitment to interpreting the Constitution according to its text. He will make an incredible Justice as soon as the Senate confirms him,” Trump said, making his first nomination to the Supreme Court. In 2006, the then President George W Bush nominated him for the US Court of Appeals for the Tenth Circuit, and he was confirmed by voice vote without objection. “I am honoured and humbled to receive this nomination. I look forward to meeting with Senators over the coming weeks as we begin this process,” Gorsuch said. In a live prime time address to the nation from the East Room in selecting Gorsuch, Trump said he was fulfilling his promise to select someone who loves the Constitution and respects laws and will interpret them as written. “This may be the most transparent judicial selection process in history. Months ago as a candidate, I publicly presented a list of brilliant and accomplished people to the American electorate and pledged to make my choice from among that list. Millions of voters said this was the single most important issue to them when they voted for me for president,” he said. “I am a man of my word. I will do as I say, something that the American people have been asking for from Washington for a very, very long time. The qualifications of Judge Gorsuch are beyond dispute. He is the man of our country and a man who our country really needs and needs badly to ensure the rule of law and the rule of justice,” Trump said. Noting that he would like to thank Senate leadership, Trump said he hoped both Democrats and Republicans can come together for once for the good of the country. Gorsuch enjoys fishing, hiking, and skiing. He and his wife care for animals, including a horse, in the small barn at their home. As a young man, he delivered papers and worked as a front desk clerk at a Howard Johnson to make extra money. “I pledge that if I am confirmed I will do all my powers permit to be a faithful servant of the Constitution and laws of this great country,” Gorsuch said in his remarks. The Supreme Court’s work is vital not just to a region of the country, but to the whole, vital to the protection of the people’s liberties under law and to the continuity of our Constitution, the greatest charter of human liberty the world has ever known, he said. House Speaker Paul Ryan said in Gorsuch, Trump had fulfilled his pledge to nominate a judge who has demonstrated loyalty to the Constitution and strong commitment to life. “He is a phenomenal nominee for the Supreme Court. His belief in judicial restraint will serve the Court and the country very well,” he said. “Congress and the American people don’t want a liberal Supreme Court justice or a conservative Supreme Court justice. We want a justice who will decide cases based on the law and the Constitution as they are written. Neil Gorsuch appears to fit that mould,” said House Majority Leader Kevin McCarthy. The Democrats voiced their opposition to the nominee. “Given his record, I have very serious doubts about Judge Gorsuch’s ability to meet this standard. Judge Gorsuch has repeatedly sided with corporations over working people, demonstrated a hostility toward women’s rights, and most troubling, hewed to an ideological approach to jurisprudence that makes me sceptical that he can be a strong, independent Justice on the Court,” said Senate Minority Leader Senator Charles Schumer. “Make no mistake, Senate Democrats will not simply allow but require an exhaustive, robust, and comprehensive debate on Judge Gorsuch’s fitness to be a Supreme Court Justice,” he said, adding that the Senate must insist upon 60-votes for any Supreme Court nominee, a bar that was met by each of President Obama’s nominees. Democratic Senator Patrick Leahy said he had hoped that Trump would work in a bipartisan way to pick a mainstream nominee like Merrick Garland and bring the country together. “Instead, he outsourced this process to far-right interest groups. This is no way to treat a co-equal branch of government, or to protect the independence of our Federal judiciary,” he said. National Abortion Federation in a statement expressed it disappointment. “We need a Supreme Court justice who will honour established precedent, including the constitutional right to privacy and Roe v Wade. 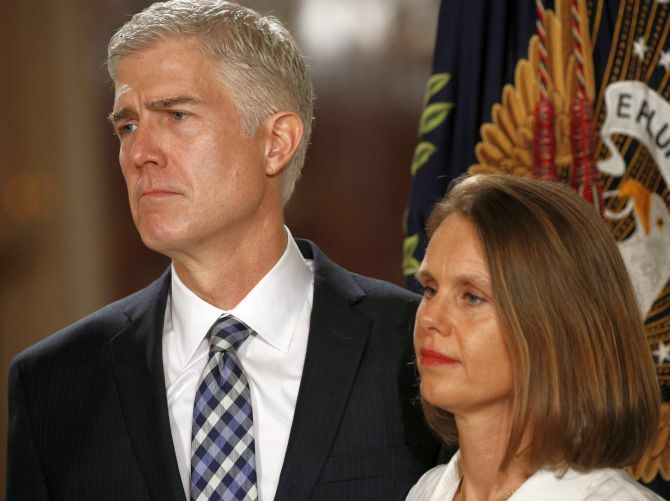 That Justice is not Neil Gorsuch,” said Vicki Saporta president and CEO of National Abortion Federation.